Josh Rosen may not like Donald Trump or Trump’s all-white White House, but Rosen did just fine in his all-white uniform, on White Out Night at the Rose Bowl. For the 5th time in a row — that’s every game this year — Rosen has thrown for over 350 yards. 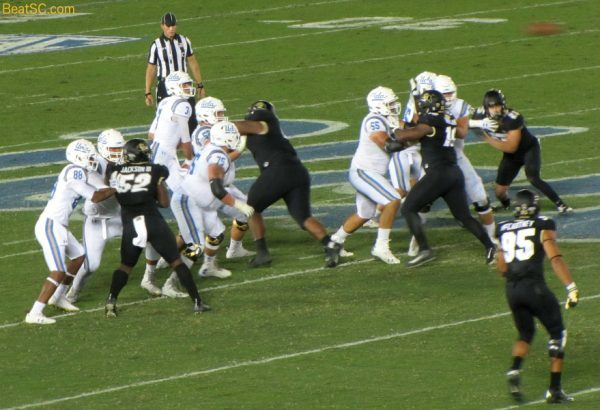 On Saturday night against Colorado, Rosen aired it out for 372 yards and a Touchdown to Austin Roberts, as UCLA outlasted the Buffaloes 27-23. Rosen had led UCLA to a 21-10 lead early in the 2nd Half, but Colorado came back and made it 21-20. The pressure was on, and Rosen came through just enough to get the W. He orchestrated two drives that culminated in Field Goals, making it 24-20, and ultimately, 27-23. Although he was again victimized by a lack of a running game, and by dropped passes, he DID get a lot of support from Jordan Lasley (7 receptions for 146 yards) and Darren Andrews (8 for 98). 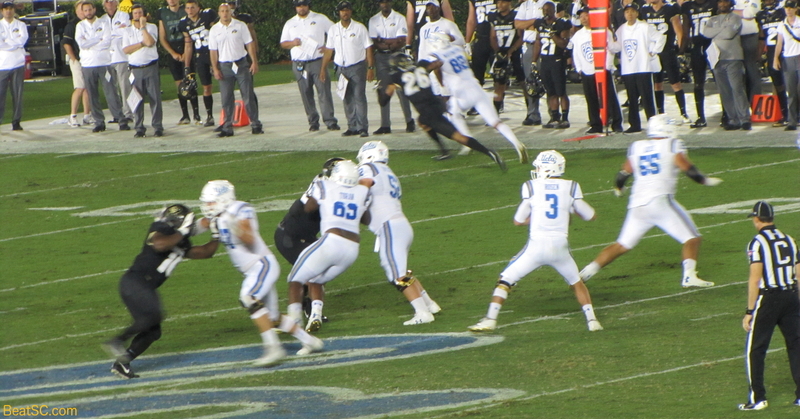 The Bruins also had 2 short TD runs, by Jalen Starks and Soso Jamabo. 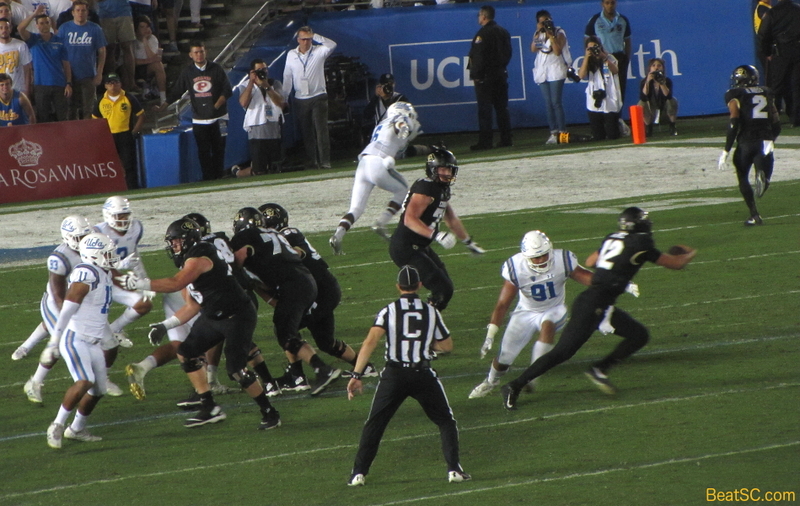 The Bruin Defense was missing both of their Freshmen Phenoms, with Jaelan Phillips still out with injury, and Darnay Holmes getting ejected for targeting, but even without those stars, they still held the Buffs to only 10 points in the first half, then only 2 field goals in the final 22 minutes. 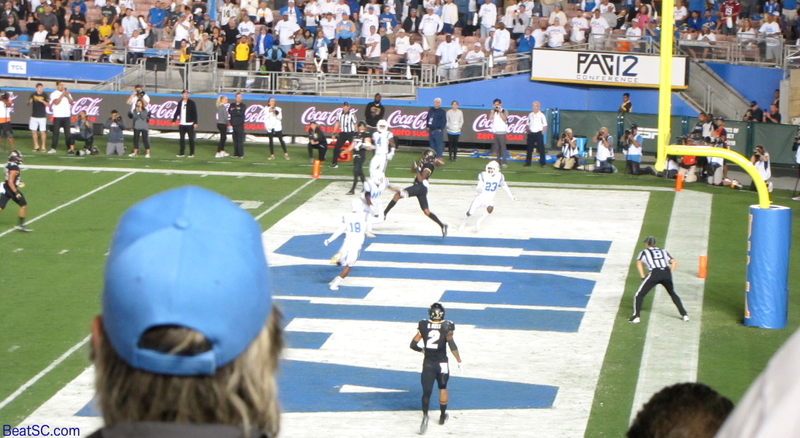 And after the Bruins’ final field goal with 26 seconds left, the UCLA Defense sealed it by denying a buzzer-beating hail mary. The Defense was far from perfect, allowing 434 Total Yards, but was stronger on 3rd Downs, stopping the Buffs on 12 of 16 tries. They were also stronger with their backs to the wall, forcing 3 33-yard field goals. 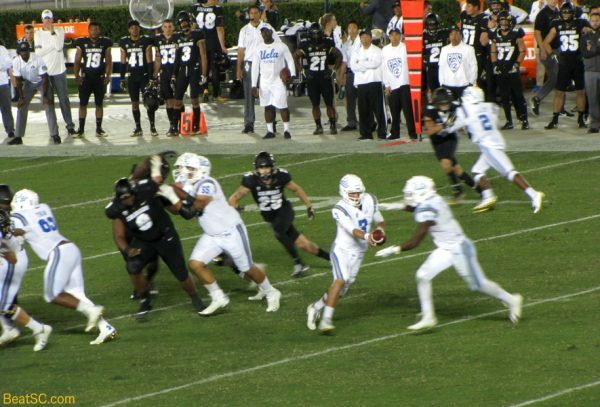 The one playcall that kept frustrating the Bruins was a Read-Option Quarterback Keeper, as Colorado QB Steven Montez rushed for 108 yards on 15 carries, including a 37-yard dash. It seemed like the Bruin Defensive Coaching Staff could not compensate or adjust, because the defenders kept getting fooled on the play, over and over. 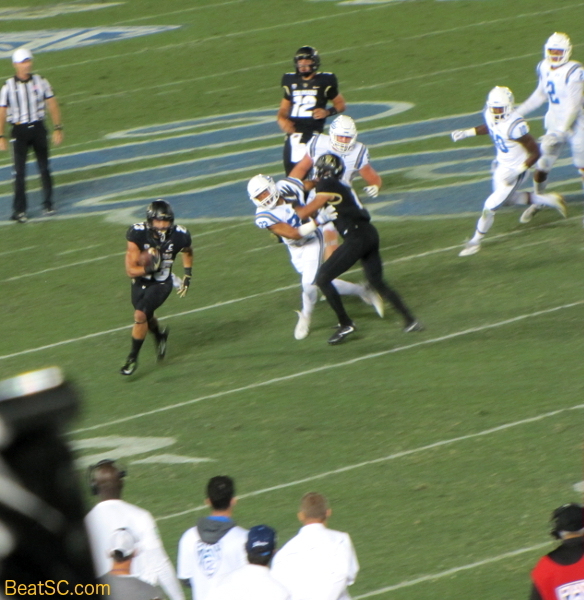 Fix that one weakness, and the Bruin Defense will be much better than they have been during September. 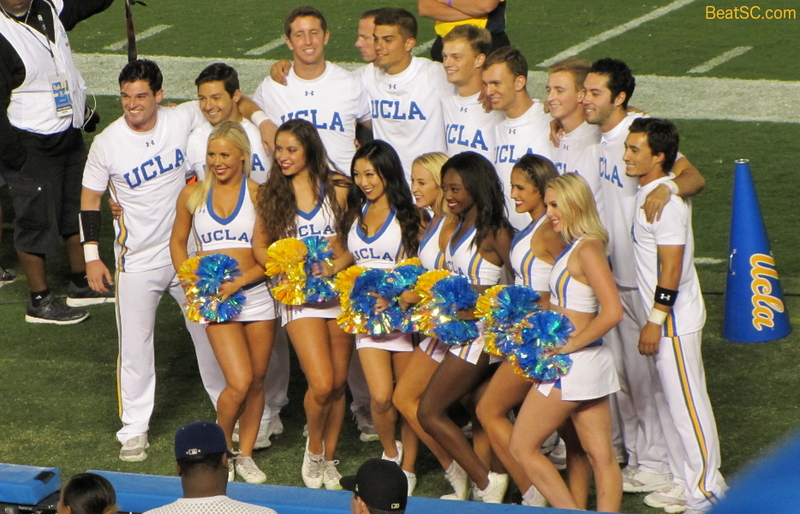 One part of UCLA that has been totally FINE in September is the Spirit Squad. 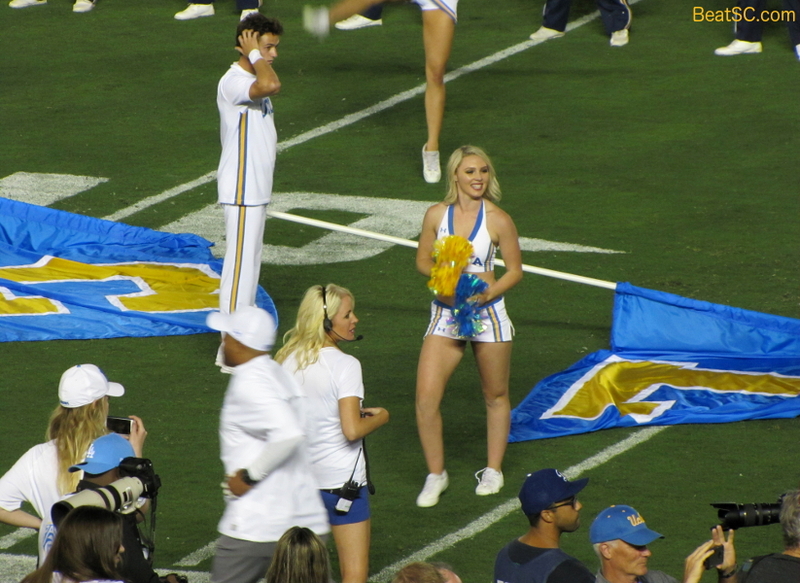 Here are 59 more photos from the Colorado game, but because it was a night game, most of my game photos were blurry and unusable, so the majority of this 59 are Cheer shots from before the game, and before the sun went down, including a few instant classics that earn spots in my personal Hall of Fame. 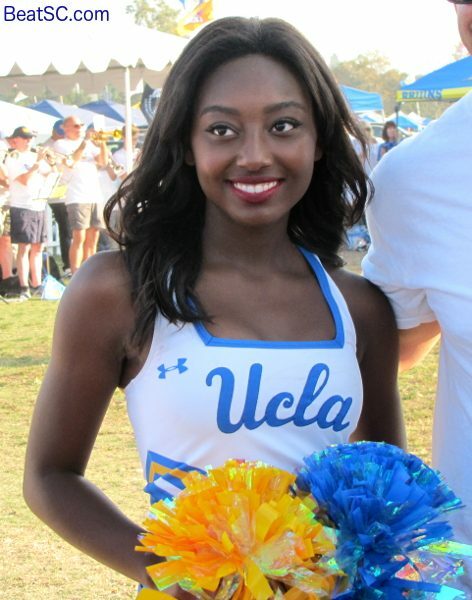 "WHITE MEN WIPE OUT THE BUFFALOES" was published on October 1st, 2017 and is listed in Blue & Gold News, UCLA/usc/Cheerleader Photos, UCLA/usc/Sports Photos. 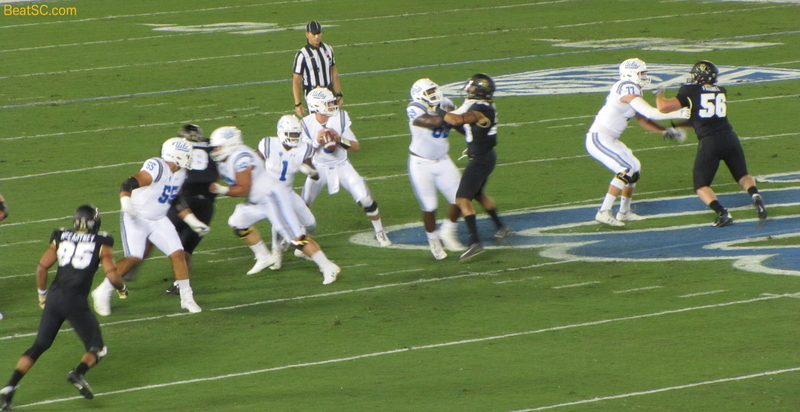 If the targeting and other cheap shots continue, I’m going to root for somebody else. 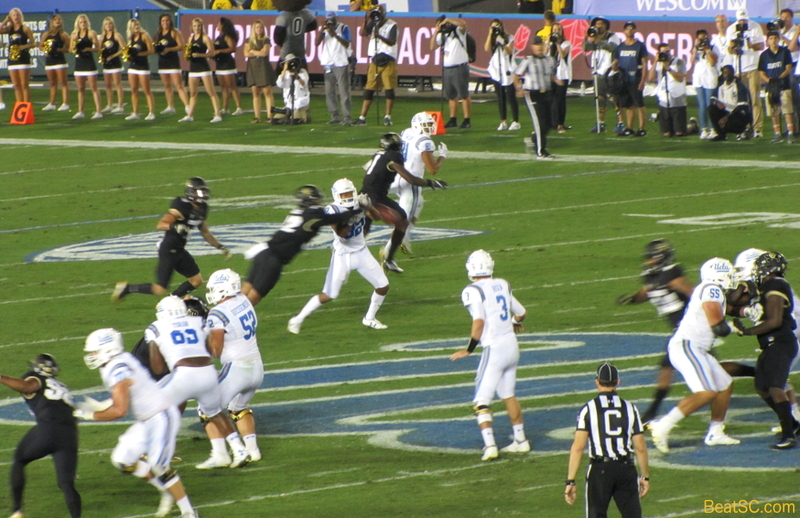 The shot delivered by Lasley was a deliberate attempt to injure another player. That is unacceptable.